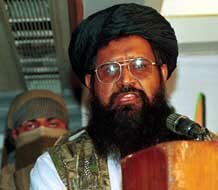 Maulana Fazlur Rehman Khalil. [Source: Public domain]The Los Angeles Times reports that Maulana Fazlur Rehman Khalil, leader of the Pakistani militant group Harkat ul-Mujahedeen (HUM), is living and operating openly in Pakistan. He lives with his family in the city of Rawalpindi and urges his followers to fight the US. Khalil was a signatory to Osama bin Laden’s February 1998 fatwa [religious edict] that encouraged attacks on Americans and Jews anywhere in the world (see February 22, 1998). In late 1998, Khalil said, “We will hit back at [the Americans] everywhere in the world, wherever we find them. We have started a holy war against the US and they will hardly find a tree to take shelter beneath it.” The Pakistani government banned HUM in January 2002 (see Shortly After January 12-March 2002), but the group simply changed its name to Jamiat ul-Ansar and continued to operate. Then it was banned again in November 2003 (see November 2003). The Times reports that HUM is openly defying the most recent ban. HUM publishes a monthly magazine that urges volunteers to fight the US in Afghanistan and Iraq. In a recent issue published since the most recent ban, Khalil calls on followers to “sacrifice our life, property and heart” in order to help create one Muslim nation that will control the whole world. The magazine continues to appear on newsstands in Pakistan and gives announcements for upcoming HUM meetings and events, despite the group supposedly being banned.